Cons: No short-term billing cycles, no guarantee of uptime, no pre-defined packages. Bottomline: A good value, and reliable host providing a good quality service. Circa 2015 updates: The folks at Web Hosting Hub report that they’ve added a few new features. Free SSD -solid-state hard drives making for faster content delivery. SSH Access for you command line-lovers out there. PostgreSQL database hosting (nice alternative to MySQL). To receive the cheapest monthly cost for their web hosting, you would obviously have to sign-up for the longest period. Web hosting companies that do not allow monthly or even semi-annually payments annoy me to such an extent that it deters me from wanting to even look at their features, so I simply just move on. The word ‘unlimited’ is littered across their website. They claim to provide unlimited disk space and bandwidth. This immediately makes up my mind about a particular host as these two features can essentially never be ‘unlimited’. I tend to feel more comfortable with a host that has well defined packages and genuine features to accompany those packages, however, this is their marketing strategy and I’m guessing that having the word ‘unlimited’ must really appeal to their client base who don’t have much experience with web hosting in general. As far as features go, they offer a website builder for those who are inexperienced at building websites. They also make use of the cPanel control panel, as well as the Fantastico script installer. To make things easier for WordPress users, within the control panel they have a preferences module that contains an ‘Install WordPress’ item. A nice perk is that they offer unlimited standard features, such as e-mail addresses, MySQL databases and FTP accounts so you won’t need to worry about running out any time soon. They offer automated secure backups of up to 10GB for an extra dollar a month. This add-on is already pre-checked on the sign-up page. They also offer a 90-day money back guarantee. I find this to be an amazing offering from Web Hosting Hub due to the fact that nowadays, you’ll commonly see that you’ll only have around two weeks to claim a refund, however this company allows you to test the waters for three whole months before you decide to stay or jump ship! If you’re creating a website for the first time and do not own a domain name, they throw that in as well for free, which is a nice cherry on top of the cake. If you do already own a domain name, they also claim to transfer your domain for free too. Transferring your website can be a daunting task; however Web Hosting Hub states that they have a transfer process that promises no downtime at all. They give you a temporary URL where you have the ability to upload all of your files, create e-mail accounts and make sure everything is in working order before transferring the domain. Web Hosting Hub’s terms of service is fairly easy to comprehend. It begins by stating some average ground rules, such as no hosting of adult content and no e-mail spamming. It also states that their hosting is not to be used for intensive software or as a backup system. The page itself is in 17 sections; therefore it is not tediously long. It is very well written as there are no mistakes in grammar and vocabulary to be seen. This is an indication that they did not skimp on this process and are professional with every aspect of their company as a whole. I’d mentioned earlier that Web Hosting Hub has a very generous 90-day full money back guarantee. However, this guarantee does not cover the purchase of any additional items, including domain names, domain privacy, dedicated IP’s and SSL certificates. After signing up, I instantly received an e-mail thanking me for choosing to host with their company and that for security purposes, they manually review purchases prior to activation. It also stated that my account was currently in the process of being reviewed and I would receive a phone call shortly. Within five minutes of signing up, I received a friendly phone call from a representative confirming my details and domain. A few minutes later, I received an e-mail containing my login information and instructions to create a password for the account. I also received another email containing the receipt. I proceeded to login to my account control panel, where I have the ability to add any additional services, manage domains and log-in to the cPanel control panel. As you can see above, Web Hosting Hub has created a custom module to assist beginners with their new website. The preferences module contains many useful items such as tutorials, the ability to update billing/contact details, the ability to change your password and language and a quick-link to install WordPress from the Fantastico script installer. From within the control panel, you can manage e-mail accounts, FTP accounts, sub-domains and add-on domains and MySQL databases. For more experienced users, you have the use of items such as phpMyAdmin, Cron jobs and the ability to create custom error pages. As Web Hosting Hub does not have any guarantee on uptime, I decided to monitor the uptime of the website for one week to give an idea of how reliable the service is. 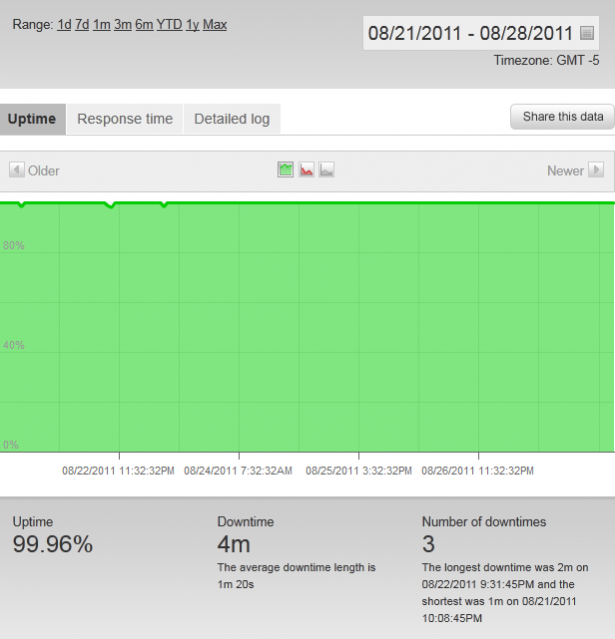 Within one week of uptime monitoring, the website experienced 99.96% uptime. The website only experienced 4 minutes of downtime on three separate occasions, the longest of which was only 2 minutes. Thanks to Pingdom for the insight into uptime! Christi N.: Hello Smair. How may I assist you? Smair: I was wondering how I would alter the media upload limit in WordPress, apparently you have to create a php.ini file? Christi N.: Hello Smair. I am more than happy to help. Please hold a moment while I pull up your account. Christi N.: Thank you Smair. Yes. Smair: Oh that is great! Christi N.: I am more than happy to help Smair. Please, go ahead. Smair: Thank you. How would I go about making specific directories, for example: “http://example.com/images/personal/”, private? Christi N.: You can password protect directories from within cPanel. Smair: Okay. That’s great. Thank you for your assistance, you’ve been very helpful! Christi N.: Thank you Smair! Is there anything else I can assist you with at this time? Christi N.: We are available 24/7 and we’re always happy to help! I found this chat session to be very friendly and extremely helpful as this company makes full use of their knowledgebase. Having a well-structured knowledgebase can easily eliminate the need for calling their support line or using the live-chat system which is very impressive. To wrap up my review, I’d say that Web Hosting Hub’s pre-defined hosting plan is great for those who are looking to host a personal website, or host a website for a small business on a shared environment. They offer unlimited features, and use the industry’s common control panel: cPanel. Unfortunately, they do not offer monthly and semi-annually payments which requires you to sign-up for at least a year, however if you don’t mind committing to a web host for that long, then they’ll do just fine. With very friendly customer support and company representatives alongside hundreds of useful features, Web Hosting Hub seems like a reliable host. Disclosure: We have an affiliation with Web Hosting Hub. After endless research I chose webhosting hub for my first wordpress site and have found them very good with no complaints. Their service has always been quick and felt comfortable asking basic questions when starting out without the feeling of being treated like a 12 year old. Definitely recommend them. I like WebHosting Hub for their 36 month plans. If I could find a web host that I like and that does a good job, I would have no problem signing up for three years.